Is the Surface right for your business? 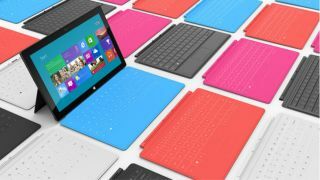 Will Microsoft's Surface tablet impress business users? Is there a Surface sized hole in your business? Mobile digital communications devices are now part of the fabric of every business. The Mobile Security Strategies: Threat Solutions & Market Forecasts from Juniper Research forecasts that employee-owned smart phones and tablets – the so called BYOD (Bring Your Own Device) phenomenon – will result in the number of smart phones and tablet PCs being used in businesses reaching 350 million by 2014. "Technology doesn't stand still: from social networks to apps to tablets, new devices and ways to use them are flying at the workforce at a breakneck pace," said Patrick Bolger, Chief Evangelist at Hornbill. "This data shows that if the IT department can't adapt to these changes and support new devices and ways of working, it won't only be unable to keep pace with the needs of the business." Microsoft Surface as enterprise iPad? The addition of a keyboard can transform the Surface into a productive business machine, but the jury is still out whether Surface offers anything that say the iPad and its myriad of apps does at the moment. And many industry watchers point to the latest range of entry-level Ultrabooks that will be arriving in 2013 that could deliver business machines that evolve the humble notebook PC into a device that enterprises can embrace. Additionally at the time of writing the Pro version is still just coming soon and has not had pricing decided, or any details of battery life. However we can assume it's going to be more than the £399 for the Surface RT, and battery life is likely to be less than the 8 hours quoted for the Surface with Windows RT. Clearly Microsoft is focused on the business community with the Surface. Yes the iPad can of course be used as a business tool, but Microsoft is betting that enterprises will be looking for technology that is focused on business and not the consumer market. However competing platforms such as RIMs PlayBook or Cisco's Cius, that are more aligned with what businesses want to do with their mobile data devices – the propensity for BYOD notwithstanding of course - have failed to set the market alight and have either been withdrawn or reduced in price to attract the BYOD consumer market. Turning its back on developing an iOS or Android-like version of Windows, Surface is a Windows machine through-and-through, which links seamlessly to Windows 8 that many businesses will upgrade to. This also enables businesses to effortlessly integrate Surface into their day-to-day operations, as they already support Microsoft's enterprise IT environment. Business users that are in the market for new portable devices may be confused about the machines on offer. All of the familiar brands will continue to build traditional Windows-based notebook PCs. Add the Surface tablet into the mix, and upgrading your Windows hardware isn't as straightforward as it once was. Is BYOD rife in your company? - If so, you can regain some level of control by offering Surface to your employees that still have a tablet experience, but one that is within your business' IT environment. Will your company be upgrading to Windows 8? - If so, integrating a tablet PC is child's play with Surface, as it shares the Windows ecosystem that your business will be familiar with. Does your business need a fully functional notebook PC? - If so, an Ultrabooks could look highly attractive, but the addition of the Touch and Type keyboards to the Surface gives the Ultrabooks a run for their money. Is your business looking to reduce costs by moving to tablet PCs? - If so, then the price of the Surface should be considered closely. As traditional notebook PCs will be available with Windows 8, they are likely to be half the price of Surface, with Ultrabooks pricing themselves out of the small business market for the short term at least. Whether Surface can make inroads into the tablet market already dominated by the iPad remains to be seen. However, in the enterprise business environment where RIM dominate, a Windows 8 tablet that fits seamlessly into a business' existing IT infrastructure and that is priced right, could deliver the business tablet that everyone has been waiting for.